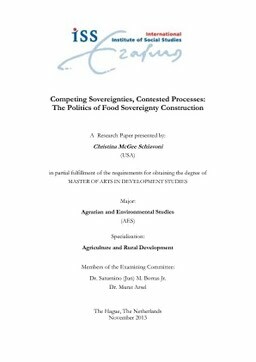 This study provides a preliminary theoretical and empirical exploration into how ‘competing sovereignties’ are shaping the political construction of food sovereignty—broadly defined as ‘the right of peoples to healthy and culturally appropriate food produced through ecologically sound and sustainable methods, and their right to define their own food and agriculture systems.’ This study was motivated by a lack of clarity on the ‘sovereignty’ of food sovereignty that had been noted by numerous scholars. Earlier on, questions focused on who was the sovereign of food sovereignty—was it the state? Was it communities? More recently, as there is a growing consensus that there are in fact ‘multiple sovereignties’ of food sovereignty that cut across jurisdictions and scales, the question has become how these ‘multiple sovereignties’ are competing with each other in the attempted construction of food sovereignty. This question is becoming all the more relevant as food sovereignty is increasingly getting adopted into state policy at various levels, calling for state and societal actors to redefine their terms of engagement. This study has attempted to explore questions of competing sovereignties, first by developing an analytical framework using the lenses of scale, geography, and institutions, then by applying that framework to Venezuela, where for the past fifteen years a food sovereignty experiment has been underway in the context of a dynamic, complex, and contested shift in state-society relations.